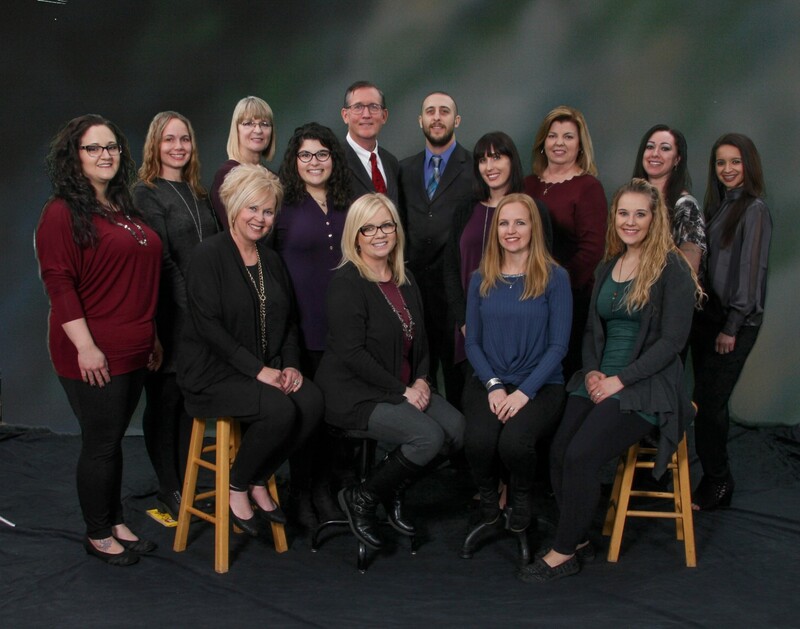 At the core of our dental practice is an experienced team of professionals that are dedicated to providing dental heath care for you in a clean, comfortable, friendly atmosphere. We take time to assess your dental health, provide you with dental health information customized to your needs, and then spend time to talk about different options - giving you the information you need to make decisions on care that is right for you. As part of our commitment to providing close, personalized attention to every patient, we want to encourage patient communication. Please know that we are here to provide outstanding patient care, and that we value the trust you have placed in us. Seated: Becky Gray, Kristen Bolin, Jen Byma, Annie Miller. Standing: Alexis Phillips, Ginger Clark, Sarah Ivins, Lariane Castro, Dr. Schneider, Dr. Loeffler, Kristin Huffman, Stacy Cargill, Tawnee Cabrera, Laura Winstead. Becky has been practicing at Dr. Schneider's office since her graduation from the San Joaquin Valley College Dental Hygiene Program in 2001. Born and raised in Lindsay, Becky attended College of Sequoias and worked in the healthcare industry before pursuing her dream of becoming a hygienist. For the last 6 years, she has enjoyed being a clinical dental hygiene instructor at S.J.V.C. Becky has one daughter, Tori, who attends Humboldt State University --- Go Jacks! Ginger joined Dr. Schneider's team in 2002. Originally from Idaho, Ginger moved to California at a young age and lived in Tulare most of her life. She graduated from Fresno City College in 2002 with an A.S. Degree in Dental Hygiene. Always seeking ways to improve her skills as a clinician, Ginger enjoys taking continuing education classes to ensure her patients receive the best care possible. One of the highlights of working in Dr Schneider's practice is that, "Patients come first!" Nichol was raised in Lindsay and graduated from Exeter High School. She attended the University of Nevada at Reno and College of the Sequoias. She graduated with honors from the San Joaquin Valley College, Dental Hygiene Program in May of 2015. She joined Dr. Schneider's practice in April of 2016 and now enjoys working with him, her brother, Dr. Loeffler and the entire team. Jennifer joined Dr. Schneider's team in 2006 as a Registered Dental Assistant. She returned to school at San Joaquin Valley College and graduated in 2017 with her degree in dental hygiene. She is now a practicing hygienist in our office! Jennifer and husband, Thomas, have two children, Payton and Holly, and look forward to the upcoming adoption of their third child from India! Kristen started working for Dr. Schneider in February 2003 as a business assistant while attending Redwood High School. After graduation, she began working full time as Patient Coordinator where she is dedicated to making sure our patients' overall dental experience is positive. She also uses her extensive computer knowledge to keep our office technology up to date. Kristen married her husband, Chris, December 2012. In May 2013 they welcomed son, Logan, and in August 2016 made another addition, daughter Marlie. Sarah is the happy voice you hear when making your dental appointment. Sarah was born and raised in Visalia and graduated from Redwood High School in 1985. She joined Dr. Schneider’s team in January 2009 as Account Executive, transitioning to her current position as Patient Coordinator in 2012. She is experienced in treatment planning, insurance coordination and scheduling. Sarah and her husband Mark, reside in Visalia with their two daughters, Kassie and Amanda. Alexis joined Dr. Schneider's team in 2018 as the Account Executive. Prior to joining the team, Alexis spent 15 years as a Veterinary Assistant and Office Manager. She was born and raised in Visalia, and graduated from Mt. Whitney High School in 2006. Alexis, her husband Zach, and two boys Dax and Jace spend their free time at the Oceano Dunes SVRA in Oceano, CA. Annie graduated from Reedley College in May 2011. Annie joined our team in November 2015. She and her husband, Brandon, reside in Visalia. Brandon and Annie welcomed their first child, Wesley Allan, in May of 2017. Tawnee lives in Lindsay where she was born and raised. After high school, Tawnee attended College of the Sequoias and worked many years at Jostens as a computer troubleshooter. In December 2015, she graduated from San Joaquin Valley College's Dental Assisting Program. Tawnee is proud to be working with "the best" at Dr. Schneider's office since March 2016. Lariane joined our team March 2016. She attended Kaplan College in Clovis, graduating as an honors student in August 2010 and became a Registered Dental Assistant shortly thereafter. Born and raised in Visalia, Lariane attended Golden West High School, graduating class of 2005. She would describe herself as an avid reader, and as someone who has a wealth of fun facts! Kristin graduated from San Joaquin Valley College Visalia Campus in 2007 and became a Registered Dental Assistant shortly after. Born and raised in Hanford, Kristin attended Hanford High School. When not working you can usually find her at Disneyland which she considers her second home!